LAKESIDE DEVELOPMENT – Target Group, Inc. LOCATION | A 700-acre parcel bound by 79th Street on the north and the Calumet River of the south; Burley Street and Green Bay Avenue on the west, and Lake Michigan on the east. for a green, 21st century lifestyle. As a joint venture between McCaffery Interests and United States Steel Corporation, the Lakeside idea is centered around a design for living differently. 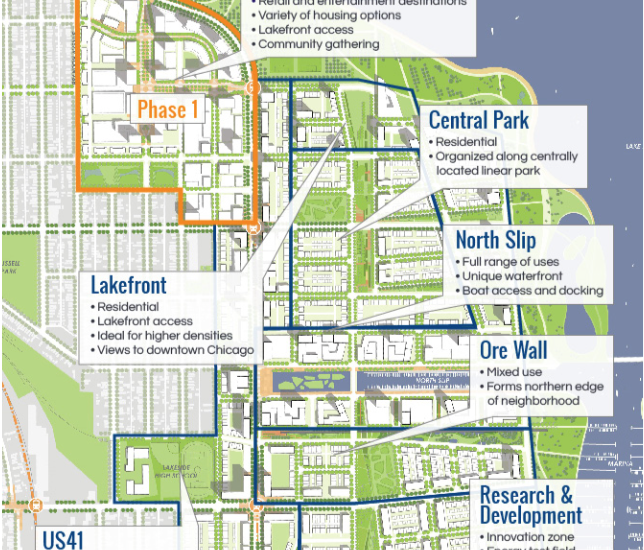 Lakeside’s vision for the nearly 600-acre site includes plans for a connected and accessible community, next generation infrastructure, innovative architecture and lakefront access, all surrounded by a vibrant mix of residential, retail and commercial space, a new high school and a 1,500 slip marina. The project, which will take an estimated 25-45 years to reach completion, will create the ultimate urban experience. Project planning and negotiations are still underway.